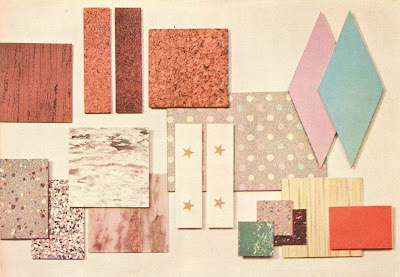 Just more vintage kitchen loveliness from 1959. 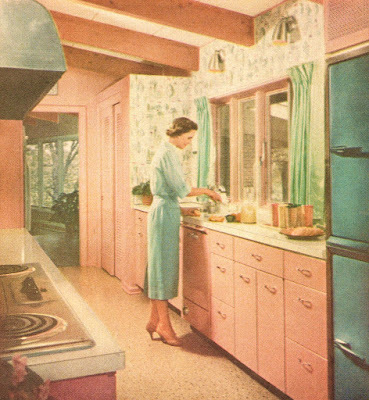 Pink steel cabinets with turquoise appliances. Love it all. It would be impossible for me, not to be immediately happy by walking into this kitchen. Have you ever seen a pink Smeg? The are the cutest little retro styled refrigerators and they come in pink! I have seen those Smeg pink refrigerators. They are wonderful. But it is that Big Chill one... that is pricey as heck... that I love the most. Love this together! Cute kitchen, I would like to cook in there! I have great affection for vintage kitchen ware and linen's. Plus I have lots of love for anything odd and pink that belongs in a kitchen. I started collecting during high school... so I have a very large collection of kitchen things that I love. I adore all types of Fire King, Pyrex, Glasbake, Hazel Atlas, Depression glass and vintage Better Homes and Gardens Cookbooks. ~ How Pink is your Kitchen? ~ Kitchen remodel @ 1934.... with Sealex floors! ~ Fire King - The Tulips! ~ Pink Ball Pitcher with the crochet cozies! ©2006-2017 FarmGirlPink.blogspot.com - All Rights Reserved.. Watermark theme. Powered by Blogger.